Of course, in the long run, it doesn’t really matter what those managers & regimes get through their thick skulls. The only thing of consequence is when working people begin to understand & organize & exercise our collective power. And there’s “the rub” of social transformation. But it is our knowledge of how to do things, our massive numbers, & our collective strength that has the power to change the world & make it suitable for children to grow free. 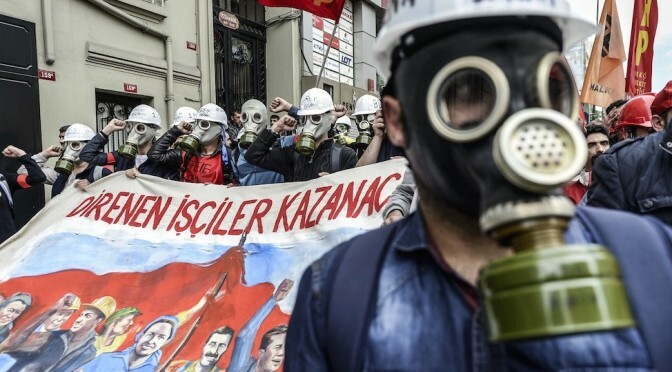 This May Day scene from Taksim Square in Istanbul, Turkey shows protestors wearing gas masks in preparation for the barrage of tear gas they expected from riot cops. Gas masks have become de rigueur attire at protests today but those who can’t get them improvise with dust masks, protest versions of the niqab, scarves. In Brazil, residents being forcibly evicted from a favela showed up to battle riot cops in barrels & all manner of metal regalia. People who don’t know how to do anything except give orders & deploy troops will find in the long run that they are no match for the creativity of working people who make & move everything on this planet. In the US, the Civil Rights movement faced such cop violence, including truncheons, water cannons, attack dogs, mounted police–but along with the anti-Vietnam War movement helped win the right to protest without assault. Of course, the same wasn’t true in dozens of other countries where (often US-backed) tyranny prevailed. We’re all in the same boat now & must stand together in demanding our rights of free speech, public assembly, & the right to oppose tyranny without being assaulted, shot, or jailed. The more they deny this, the more they prove our need to boot them from here to kingdom come. The banner here reads “Workers who resist win.” True! And workers who resist respect their own collective power.